A formal dress code only seems natural in the context it was meant to be applied. It is quite fascinating to observe a group of people following a same code dividing at the end of a ceremony or a formal event. The uniform that was allowing one to seamlessly fit in just a moment earlier almost becomes an unusual costume when melting into a regular crowd. Inspired by those visually rich and contrasted situations, the FW19 collection takes key elements from different aesthetics, juxtaposing them to compose a colourful portrait. Pleated poplins, satin bands and black velvets, which are referring to the classic evening attire, merge into unconstructed checkered flannels and boiled wool blends. 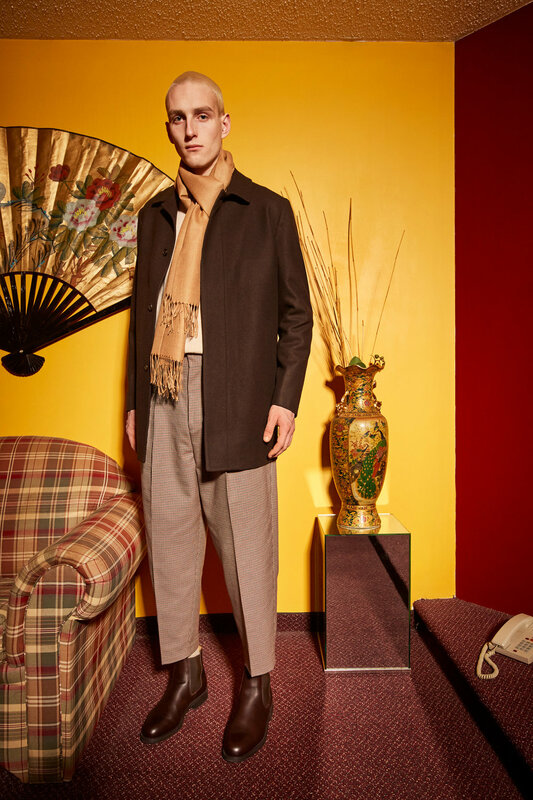 Tailored overcoats and jackets worn over work shirts, resulting in unconventional layering, also contribute to the heterogeneous aspect of the collection. For the occasion, the lookbook was photographed in a vividly coloured hotel decor, which seems to be frozen in time. Traditionally a place where people from all backgrounds come across, the hotel naturally stages the collection and the idea of disparity leading its aesthetic.